Roti is a family run restaurant which opened its doors on the 1st of January 2017. 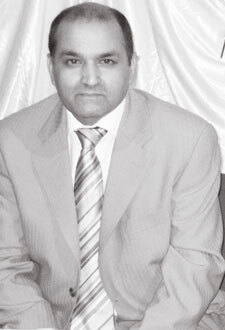 We come from a background of existing successful eateries in Edinburgh managed by Mohammed Din. At Roti, our main aim is to deliver a mouth-watering and flavoursome menu created from authentic traditional recipes resulting in quality Indian and Pakistani cuisine. Our traditional cooking methods ensure all ingredients including fresh herbs and spices bring out maximum flavour. We take great pride in using fresh ingredients in our dishes which are prepared daily by our highly experienced team. Try one of Roti’s tasty chaats, delicious tandoori items, full of flavour biryanis or the most appetising curries, you will not be disappointed! And make sure to ask our staff about our yummy vegan and gluten free options. Mohammed Din born in 1955 moved to the U.K. from Pakistan in 1967. He opened his own clothing manufacturing business in the late 1980s after having worked for some time driving buses. After a few years the business started to struggle as more and more businesses were importing from abroad, Mohammed then decided to move to Scotland with his wife and children in the late 1990s. In Edinburgh, Mohammed started to work at an Indian takeaway; he started off as a kitchen porter, then trained as a tandoori chef and then finally learned to cook. In 1998 Mohammed decided to move on and open his first Indian takeaway in Corstorphine, the business was a huge success and gave him the opportunity to open his first Indian restaurant. He then, opened further 2 restaurants one being Roti.